This NSA PRISM and online surveillance story is enormously important. It has opened up a new nationwide, perhaps global, discussion on personal privacy and the tradeoffs people are willing to make between privacy and security. It may lead to new law, new cultural norms, new technology. However, it has already led to some excellent material for some very funny people. We would be seriously remiss if we didn’t sift through it a bit. Of course, the joke would probably be lost on most Americans if he’d used the Chinese leader’s name… But that’s another matter. So elegant. If only they’d used “NSA” instead of “CIA.” The poor CIA – they get blamed for stuff just kind of out of hand (by the way, I wouldn’t want to be the marketing guy for the National Speakers Association). There’s a funny piece in the novel World War Z where a former CIA operative goes on a screed about how, to paraphrase, “it’s not like the CIA was actually collecting information on everything everybody did.” I love it when a novelist’s imagination is outdone by reality. Of course, the other tactic is to go over the top with a healthy dose of profanity (the Internet has been a boon to folks who like to swear on video). Funny or Die delivers in a big way here, with a spoof of a spokesman announcing a new program on behalf of AT&T and Verizon, Operation: Everyone Talk Like a Terrorist All the Time. 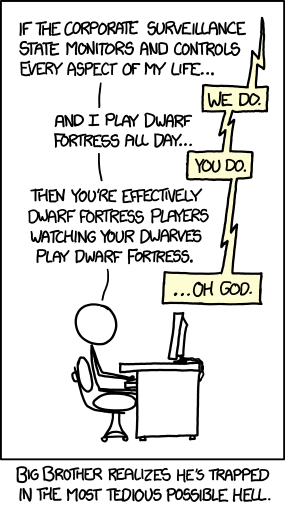 Dwarf Fortress has been described as “the most inscrutable video game of all time,” so no worries if you don’t get the joke. But there’s something kind of a priori funny about the comic anyway, right? Is the U.S. government really playing an epic game of Dwarf Fortress when it comes right down to it? Oh, and if there’s one trend that trumps even instant Tumblr accounts it’s the rise of the memes. Surf the Internet much, then you know the base group of images used to make a joke. Suffice it to say that everyone and your mother has taken a swing at Obama and the NSA this way. Seriously, you think the NSA could at least lend a helping hand. That’s right, just about half the Internet-using world has been doing the NSA’s job for them for years… So what's all the fuss about?